You may be eager to learn how to use Adobe Dreamweaver CC (Creative Cloud) to create great websites, but you'd like to tackle it at your own speed. If so, this book-and-DVD learning combo is perfect for you. More than 16 lessons, each including step-by-step instructions and lesson files backed by video tutorials, guide you smoothly through website design to implementation to maintenance, helping you build solid skills at your own pace. It's like having your own personal Dreamweaver instructor at your side. 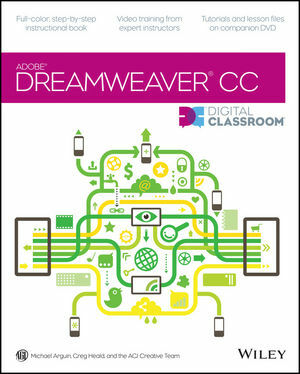 You'll be building websites, formatting web pages, and creating forms in no time with Adobe Dreamweaver CC Digital Classroom. Michael Arguin is a web applications specialist at American Graphics Institute, where Greg Heald is a senior web design instructor. They are members of the AGI Creative Team, which develops and delivers global training programs for creative, marketing, and communications professionals.